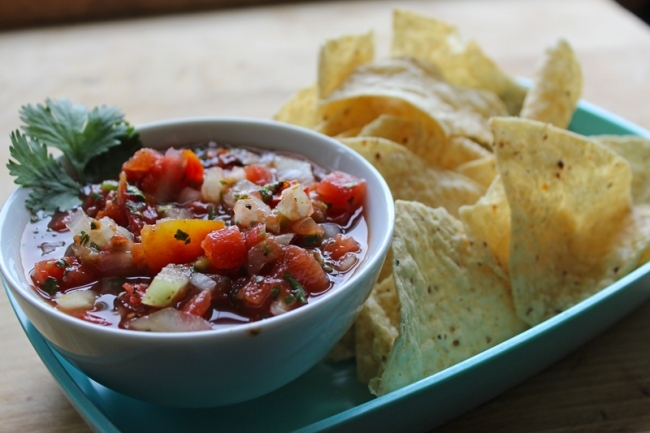 Pico De Gallo is a type of salsa that is chunkier and thinner or juicier than the salsa you might be used to. It’s somewhere between salsa and gazpacho. This recipe that I make is so awesome that the entire batch disappears almost as fast as the time it takes me to whip up a bowl of it. It’s the kind of stuff that once you taste it, you can’t stop eating it til it’s gone. Yes, it’s that awesomely good! Gather and prepare all of the ingredients listed below and stir together in a large mixing bowl. You can start eating it immediately or cover and refrigerate for awhile to let the flavors “fuse” and it gets even better. We eat this with tortilla chips and put it on burritos, tacos, and eggs. It’s worth taking the time to make a batch and give it a try. It has a little spicy bite to it so if you are sensitive to hot and spicy foods, you can cut down on the jalapeno or eliminate it altogether (although it won’t be the same without it). 1 medium to large, FRESH jalapeno pepper, finely chopped, seeds and all. 2 to 3 pinches of salt (I use locally produced sea salt) & fresh ground pepper, or to taste. 1 handful of fresh Cilantro (enough to fill between 1/4 tp 1/2 cup after being very finely chopped) Make sure you separate the leaves from the stems and discard the stems before chopping. Also – It is very important to use FRESH cilantro, not the dried stuff from a jar. This recipe won’t be the same otherwise. BTW – This contains no fats, oils, or sugar. Leave out the salt entirely to stay entirely heart-healthy or include it if you’re being bad.